Later today, a group of Sacramento region political, business, and labor leaders will wrap up a four-day lobbying trip in Washington DC. The 86 member delegation, organized by Sacramento-based business advocacy group Region Business, includes Sacramento Mayor Darrell Steinberg and Elk Grove City Council Members Pat Hume and Darren Suen. 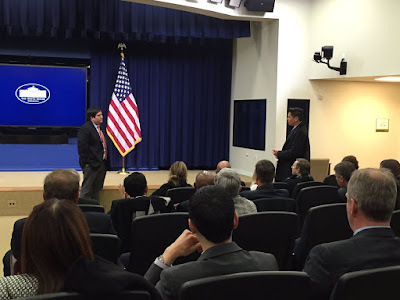 administration during the delegations visit to the Whitehouse briefing room. The lobbying trip, called the Capital Region Executive Leadership Mission, is the first one organized by Region Business. According to Region Business Executive Director Joshua Wood, the focus of the mission is slightly different from the Sacramento Metro Chamber of Commerce's well established and long standing Cap to Cap lobbying trip. "The focus of this trip has been on the executive branch," he said. The delegation has been focusing on lobbying for the region, specifically on issues including homelessness, farm to fork, healthcare, workforce training, and infrastructure projects. Wood noted the Trump administration has said it would like to spend up to a trillion dollars on transportation infrastructure. Among the projects of interest for the Elk Grove delegation is pursuit of funding for the Capital Southeast Connector road. The road, which seeks to connect I-5 in Elk Grove to U.S. Highway 50 in El Dorado Hills has been one of the City of Elk Grove's long-term priorities. "Elk Grove is obviously trying to tee-up the connector," Wood said. Wood noted the plethora of Federal programs and suggested the Sacramento region has not tapped into enough of the funds to support local programs. As an example, he pointed to the farm to fork movement that might be able to help alleviate so-called food deserts. "We are trying to figure out what are some of the pots of money we can into to help support ag," Wood said. " Although the trip is independent of the annual Cap to Cap trip, Wood noted the delegation includes among others the Sacramento Asian Pacific Chamber of Commerce, Sacramento Metro Chamber, the Builders Exchange, the Downtown Partnership, and the Sacramento Central Labor Council. "Republicans and Democrats both agree on the infrastructure that could be in the trillions," Wood said. "So how do we tee up all these projects we have been talking about for a while." Another area of focus for the delegation has been federal permit streamlining. Noting that several agencies are involved in the approval of projects, Wood said they are seeking to simplify the permitting process. With regards to workforce development, Wood stated the Sacramento region does well compared to other areas, and the delegation wants to ensure its continuation of Federal funding for these programs. "There's a change in administration, so we want to make sure that we don't lose that funding," Wood noted. Elk Grove residents may have an opportunity to hear a report from Hume and Suen should they include a report on their results during their comments on recent activities at the Wednesday, March 22 City Council meeting. Yep, the Connector is the Holy Grail or the Holy Land for developers! Take rural farm land prone to flooding, call it a congestion reliever, play the flood card, have the taxpayers pay for your road and presto, you have shovel ready land for years of new rooftops and retail! The smart money bought that land years ago at farmland prices and ka-ching, you now have it-massive profits, a free road and flood improvements, and owned politicians in your pocket to say yes! It makes me giddy to think Elk Grove will someday have over 250,000, maybe 300,000 population! As the old Western Airlines commercial use to say while sipping champagne on top the plane, "the only way to fly"! Air Traffic Control just spotted their plane!